Since the financial crisis, regulators have been working to address the perceived gaps in OTC derivatives regulation. They have focussed on improving the transparency and safety of the market through centralised clearing and transaction reporting. But many important details remain to be clarified. And as the European Parliament deliberates on the proposals, more amendments are expected before its introduction by the end of 2012. 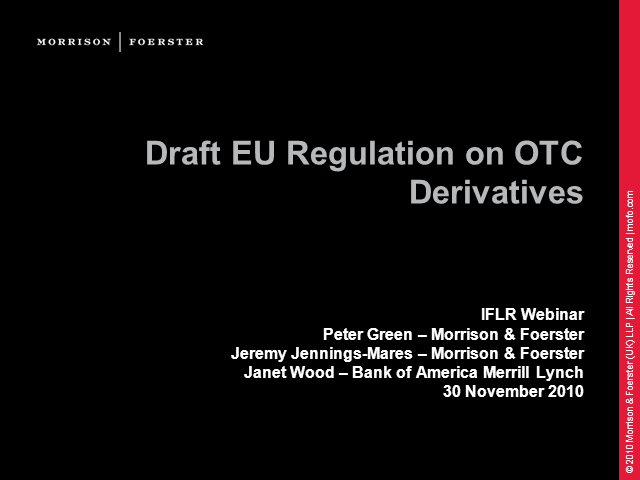 This web seminar, in association with Morrison & Foerster will consider the proposals, including comparing them with relevant provisions of the recent Dodd-Frank legislation in the US and assess their likely impact on the OTC derivatives market in the EU and internationally.